Disclosure: I received a free copy of Influencer Marketing for Dummies for review. It’s been over a year since I’ve written one of these Blogging Tips posts. So let’s talk about some of the things I’ve learned as a blogger in the past year. A couple weeks ago, I received a copy of Influencer Marketing for Dummies to read and review. I thought this book was a perfect fit for my Blogging Tips series. So, along with a review, I’m also giving a copy of the book away to one lucky reader. Just enter the giveaway below through Rafflecopter! So much has happened in the past year. When I first started blogging in 2013, I had just finished dental hygiene school and was in the process of getting my license. So I had a lot of time on my hands to learn how to blog and to take photos for my recipes. When I moved my blog to self-hosting, I had just received my dental hygiene license and began looking for work. So I still had a lot of time to learn how to run a website and how to grow my blog. But over the last year, I began working as a dental hygienist about four days a week. It definitely became harder to update my blog regularly. I had to learn how to balance both my day job and blogging. Which meant a lot of schedule management and organization, and a lot of times, I’m just not good at it. Sadly. Lol. Blogging started out as a way for me to express my thoughts, a place where I can de-stress. And it has definitely become a lot more than what I started with. But the thing is, blogging is a hobby for me. I might be making a little bit of money by writing sponsored posts and having ads on the blog, but that’s just an extra perk. Blogging is something I enjoy doing, which is why I like learning everything I can about it. From social media to connecting to brands, it’s just all part of what I’m passionate about. I mean, who wouldn’t love to get paid to do what they love to do, right? 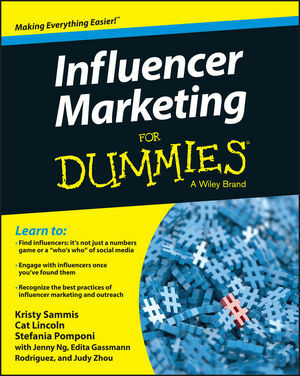 While Influencer Marketing for Dummies is actually written for brands and companies looking to connect with bloggers and social media influencers, it’s a great resource for us as bloggers too. In this book, we learn about the different things brands and companies are looking for in a good partnership. Brands want influencers who are genuine, who would not sacrifice their own voice to make an extra buck. It’s definitely hard sometimes to not sound so sales-y (I know, I made up another word), but be yourself when you talk about products. You have to like the products that you write about. Otherwise, you won’t be able to connect with your readers. Your readers can feel when you’re not being authentic so it’s important to always be true to yourself and to maintain your own voice even as you’re working to promote a product. How many of you have checked your stats? Like constantly at one point or another? Me…. What? I can’t help it! Lol. But the thing is, it really shouldn’t matter. And brands and companies won’t just look at how many views you have or how many subscribers you have. What really matters is the quality of the content. Because let’s say you have hundreds of thousands of subscribers, but your content is lacking in quality, these companies won’t want to partner with you. Why? Because they’re looking for someone who would fit well with them. They’ll want good quality writing, nice photos, and a good engagement of the audience. These are some of things you can learn from reading this Influencer Marketing for Dummies. You’ll also learn about the different social media platforms and the best way to utilize them. You can find a copy of this book on Amazon or you can enter for a chance to win below. You must be 18+ to enter and a resident of the U.S.
Just out of curiosity, why do you blog? This entry was posted in Blogging Tips, Giveaway, Uncategorized and tagged giveaway. Hi ya often read your blog light bright original and with super duper things to eat! It was very interesting to hear how you started it. Tried to enter comp for book with 20 hrs to go it said but it would not let me comment! As for blogging it was the best thing I did when I moved from London to Brighton. The first time living with my partner of 30 years! So difficult to ‘fit in’ make friends etc! Originally a friend persuaded to do it because I was a fledgling poet and had published a collection but all sales came locally anyway but I was hooked! Since then I sometimes get my poems in mags and comps won’t accept blogged poems anyway. So early on it became news, views, reviews, home spun philosophy, loads of photographs. I used to be a puppeteer, became a single parent, taught gypsies, art and became a therapist. I am amazed that people from all over the world sometimes read me. Yes wish I had more followers so maybe will buy that book anyway. Thank you for the great tips! I absolutely adore New Zealand – the people, its clean and fresh outdoors, and the feeling that I can do anything and accomplish everything when I’m there. I think about NZ constantly and I also love to write so blogging seemed like the obvious choice. It means I can share endlessly about my adventures and experiences and maybe a reader will be inspired to check it out one day. Thank you for the info! I love reading other bloggers tips. As a newbie I need to educate myself as much as I can!